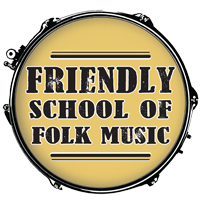 The Friendly School of Folk Music is a 501(c)3 nonprofit organization. All donations are tax-deductible and we will email you confirmation receipt of any monies donated to the school. We appreciate donations to help keep our tuition reasonable and support our professional musician instructors. We also gladly accept instruments in working order or would need little work to get them going again and we are always in need of office supplies. Please give us a call at 708-749-1932 if you would like to ma ke a donation!